This film is based on a true story about the Navy SEALs who were a part of Operation Red Wings in Afghanistan. If you've seen the commercials, read the book or just know the true story, then you know that four men go in but only one returns. 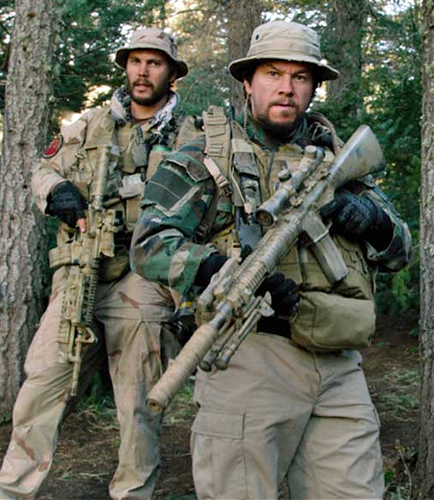 Mark Wahlberg plays the role of Marcus Luttrell, the lone survivor, who spent a day battling against Taliban members in a very grueling and dangerous fight where his team was out-manned and out-gunned. A very straightforward movie, Lone Survivor simply gives a visual to a very compelling and intense true story. It makes you realize just how tough it is to be a member of the military. Total kudos to everyone involved. So although the movie isn't quite thought-provoking, it's very compassionate. This is probably one of the most original screenplays out there--a movie about a lonely guy who falls in love with his operating system. But it's also so much more than that, and it shows in the emotion of Joaquin Phoenix and the voice of Scarlett Johansson. This film has an existential feel to it--probably because the main character is constantly talking to a computer, but it also hits deep with the human need to connect. Once you get past the awkwardness of sexual interaction, futuristic technologies and unfashionable high-waisted pants, the movie is actually pretty good. Will love to see "Her"! Sounds like a great one! I've been dying to see HER because of it's directed by SJ. Good to know it's actually pretty good. I saw Her a few weeks ago and really loved the movie. Mostly because it was original as you said but also because everything that was happening was relatable and debatable. It's such a good movie to talk about afterwards. Plus, everyone in the film did a great job. I haven't seen Lone Survivor...but mostly because I don't know if I can get through it. I'm such a sensitive person that I may be able to handle the extreme of the story. I know what will end up happening but it's such a tragic, sad tale that it breaks my heart just knowing about it. Sappy much? Love your blog! I haven't seen these movies, but I really want to see Her. I've heard so many great things!! Uh! Now you made me really curious!! Gonna watch it!! Thank you for the great comment. I haven't seen either of these movies. I might end up seeing Her eventually but I probably won't see Lone Survivor because I already know the story and it's pretty depressing.